The June issue of the Bulletin has been published and is available. 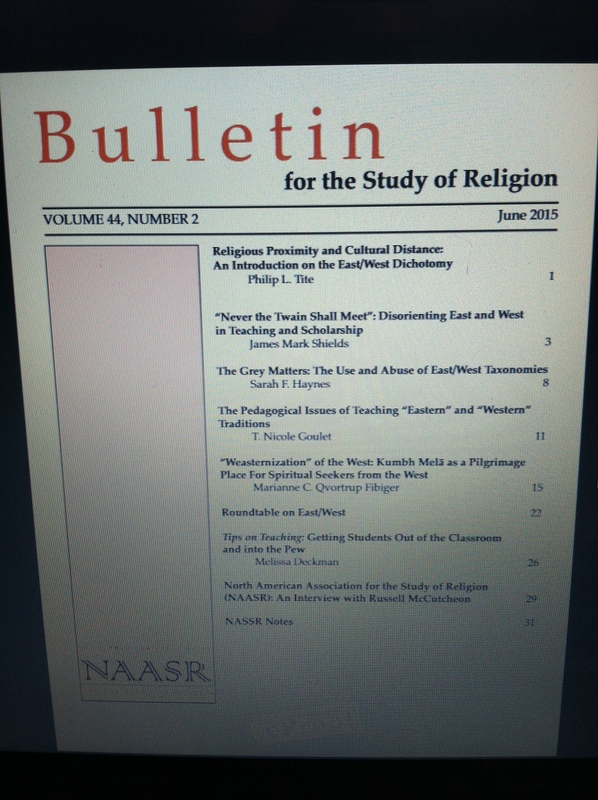 Below is the table of contents of this issue, which includes a panel of papers on the construction of “East/West” in the study of religion. This debate began on the Bulletin’s blog and has been continued in this issue, with the hope that others will jump into the discussion both on the blog and in the Bulletin itself. This issue also includes a “Tips for Teaching” entry by Melissa Deckman, who teaches a course on religion and politics. We are also pleased to include an interview with the new president of NAASR, Russ McCutcheon, as well as a selection of NAASR Notes that have become a regular feature on the Bulletin’s blog. This entry was posted in Academy, Announcements, James Dennis LoRusso, Matt Sheedy, Pedagogy, Philip L. Tite, Politics and Religion, Religion and Society, Religion and Theory, South Asian Studies, Southeast Asian Studies, Theory and Method, Theory in the Real World and tagged Bulletin for the Study of Religion, Eastern religions, James Mark Shields, Jason Blum, Marianne C. Qvortrup Fibiger, Melissa Deckman, NAASR, Naomi Goldenberg, orientalism, pedagogy, Religion, religious studies, Russell McCutcheon, Sarah F. Haynes, scholarship, Sean Durbin, T. Nicole Goulet, teaching, West/East. Bookmark the permalink.